Thomas Edison conceived the principle of recording and reproducing sound between May and July 1877 as a byproduct of his efforts to "play back" recorded telegraph messages and to automate speech sounds for transmission by telephone. Edison's phonographs recorded onto a cylinder. Emile Berliner patented his Gramophone in 1887. 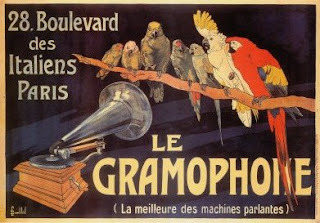 The Gramophone involved a system of recording using a disc. The disc could be easily mass produced by molding and stamping, and required less storage space for a collection of recordings. Through experimentation, in 1892 Berliner began commercial production of his disc records, and "gramophones" or "talking-machines". From the mid-1890s until the early 1920s both phonograph cylinder and disc recordings and machines to play them on were widely mass-marketed and sold. The disc system gradually became more popular due to its cheaper price and better marketing by disc record companies. Edison ceased cylinder manufacture in the autumn of 1929, and the history of disc and cylinder rivalry was concluded.